You are at:Home»Herbs»Emblica officinalis Gaertn. Latin name : Emblica officinalis Gaertn. Amla is an extensively used herb in making herbal medicines. 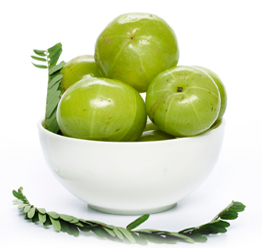 Amla is supposed to rejuvenate all the organ systems of the body, provide strength and wellness. According to ayurvedic experts regular usage of amla will make our live more then 100 years like a youth. Amla keeps us away from all the diseases by boosting our immune system. It is known as Emblica officinalis in biological terms and amlaki in Sanskrit language. It is the richest natural source of vitamin C.
It is very helpful in skin diseases. It promotes glow on skin and delays wrinkles or loosening of skin. It prevents premature graying of hairs and dandruff. It acts as an effective natural cure for indigestion, acidity, constipation, gastric troubles, and flatulence. It is helpful in improving liver function. It helps in lowering cholesterol and blood sugar level. It has very good results in chronic cough, child hood and allergic asthma and tuberculosis. It provides nourishment to the nerves and is helpful in paralytic conditions. It also works as brain tonic and helps to alertness and memory. It helps in improving quality of sperms due to its madhur (sweet) vipaka property. It also acts as anti-inflammatory agent thereby suppresses pain and swelling. It finds great application in improving eyesight. It also improves general health weakness and makes our body’s immune system strong therefore help to fight diseases.